I’ve made these four times now, and for each occasion I’ve been given quite a few compliments and some much appreciated feedback. They are really quite good and so I’ve decided to share them here. These are an adaptation of one of my mother’s recipes. 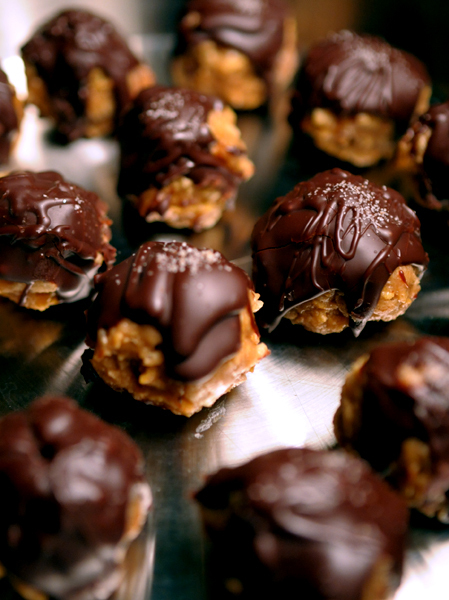 My mother made these as bars topped with a powdered sugar syrup that hardens into a carmel-like topping when cool. She called them Peanut Butter Chews. I have loved these since I was a little girl. But, as any one who knows me can attest, I am an unabashed choc-o-holic. 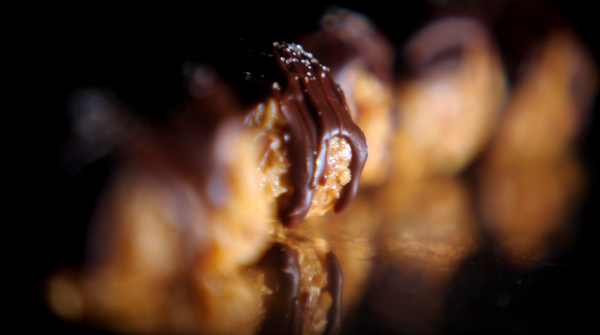 I wanted to dress these up a bit and find a way to combine the peanut butter base with my love of rich dark chocolate. As I said the results are in. These are a definite keeper. You start by putting the Rice Krispies and Corn Flakes in a large deep pot (the high walls make it easier to combine the ingredients than using a bowl). Add PB and vanilla and stir to combine. In a double-broiler melt the corn syrup and brown sugar together. When melted pour over the PB and cereal mix. Mix it all together. This is not easy as everything is highly sticky, but it’s well worth the effort. Cover a large baking tray with wax paper, then pull out a small amount of your PB mix and form into balls, setting them aside on the wax paper. Again, this is a rather long process and not easy, because this stuff is really a sticky mess to work with. Once you have all the PB balls formed stick them in a freezer for 20-30 minutes. Now that the balls are ready chop two bars of dark chocolate (I like Ghirardelli) and place into a large glass mixing bowl. Bring heavy cream to a boil and then pour it immediately over the chocolate. (Watch this step closely because the cream will boil and then rapidly spill over if you are not careful.) Whisk the cream and chocolate together finally adding the rum and doing a final quick whisk. Spoon the chocolate over the balls and then top them with sea salt. I usually put these in the fridge before serving them. You don’t want the chocolate to melt all over someone’s hands. The next time I make these I am thinking of making one bar of white chocolate and 1/2 cup of heavy cream for a lighter, decorative topping to the dark chocolate. There’s only one problem with these…they don’t yet have a name. I’m looking for something cool and suggestions are welcome. keep it up, foodie friday. sorry i missed you today, just barely.